C-152 Size: Medium Features: -Christmas tree stand. -Material: Plastic. -Out performs every other Christmas tree stand on the market. -Patented easy-fill reservoir accommodates low branches. -Spill guard prevents over-filling mishaps. -3 Tempered rust-proof spikes in center of reservoir anchor tree preventing shifting. Product Type: -Live Tree Stands. Max. Trunk Diameter: -6"-8". Material: -Resin/Plastic. Color: -Black. Country of Manufacture: -United States. Holiday Theme: -Yes. Seasonal Theme: -Yes. Holiday: -Christmas. Season: -Winter. Size Medium - Max. Tree Height: -6 - 7.9 ft.. Size Large - Max. Tree Height: -10 - 11.9 ft.. Dimensions: -Medium Tree Height: 7 ft.. -Large Tree Height: 10 ft.. Maximum Trunk Diameter: -6". Size Medium - Overall Height - Top to Bottom: -7.4". Size Medium - Overall Width - Side to Side: -16.3". Size Medium - Overall Depth - Front to Back: -16.7". Size Medium - Overall Product Weight: -3.2 lbs. Size Large - Overall Height - Top to Bottom: -9.5". Size Large - Overall Width - Side to Side: -20.4". Size Large - Overall Depth - Front to Back: -20.3". Size Large - Overall Product Weight: -4.88 lbs. 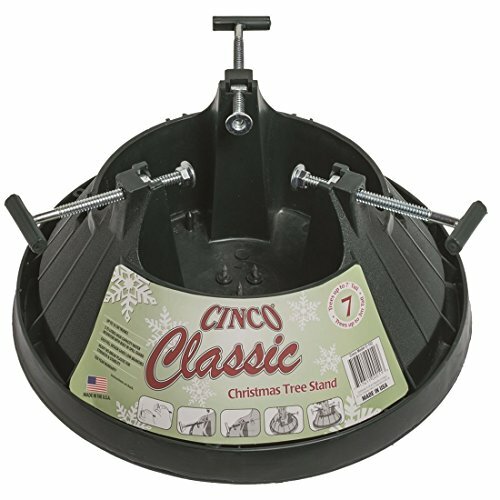 Heavy Duty 8 Brace Christmas Tree Stand. This New and Improved Stand For Big Chrsitmas Trees!